Always dreamed about having your own sailboat and taking the ultimate trip? If you’ve dismissed the idea as too dangerous, too expensive, too difficult, take another look. 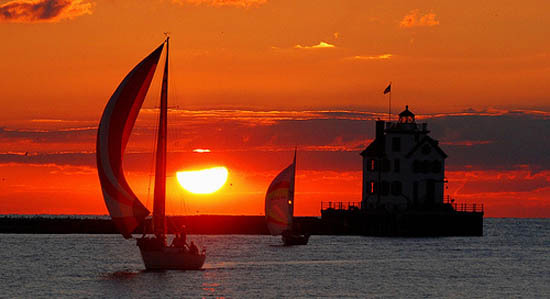 SAILBOATS CONJURE UP the most romantic visions. Seeing their silhouettes at dusk makes it easy to think of chucking it all and heading off into the wild reaches of foreign seas. There will be extreme adventures, new discoveries and no one to answer to ever again. The reality, though, is that a sailboat is a few tons worth of fiberglass and steel and you must have some skills to operate it. Thousands of questions have to be answered before you set out, but the bottom line with boating is—just make the decision. Here are the top five pointers about boating that I’ve picked up from my own never-ending quest for the perfect lifestyle. A long lost fire was reignited with that one chance encounter and before I knew it, I’d bought a 25’ sailboat on eBay (2k) and was driving into the remotest corners of Baja, Mexico to learn how to sail it—just me, a tiny boat and a salty captain. Essentially, I put the cart before the horse and let my overwhelming thirst for adventure get the best of me. Boat first. Lessons later. Who cares? I simply did some online research and found a five-day course that offered a US Sailing Certified program, one where the entire week was spent on the water, not in some stuffy classroom looking at pictures of tying knots. I figured by the end of the week I’d be able to sail, with a crew, quite efficiently. Instead, by the end of Day 1, I was already single-handing the thing–tacking, jibing, running the sails, steering in and out of the harbor, and living and breathing the points of sail to the tune of sheer exhaustion. I went into the bowels of Baja a complete novice and came back tearing up Highway 1 certain that when the time was right: here I come tropical waters. 2. Eventually, the bells and whistles do matter. When you are looking at your first boat, it’s common to get wrapped into “What sort of vessel can I procure for nothing?” That was my MO for my first boat (which I sold due to relocation), but for my second boat, I wanted upgrades. So, after I came into a small windfall of money from a TV show I’d just worked on, I bought a 30 ft. C & C on a whim and outta nowhere, I was back in business. The basics were already in place: refrigeration, USB radio, roller furling sail, single-handing setup, but for me, it became about vanity and comfort. I spent the summer working on the boat, installing a top-notch stereo system with kickin’ cockpit speakers and main cabin built-ins; replacing crummy dock lines and cleaning up my slimy fenders. I had a pal recover all the interior cushions and make tropical themed curtains; I ordered new cockpit cushions; and I set up a top-of-the-line GPS system with full high-res satellite imagery, a handy fishfinder and my favorite, a g2 Vision card (imagine aerial color photos of unfamiliar marinas and a 3D perspective of maps). In the end, all these bumps helped out when I wanted to sell the boat in the dead of winter. I actually made my money back and then some…plus it sold almost the second it went on the market. I can’t actually swim. Sure, I can doggy paddle and I can crank it underwater with the best of them, but as far as over-handed swimming, I’m no champ. One reason I bought a boat was to overcome my fear of the water. What I slowly learned over the Chicago boating season was that the more you are in the water, the more comfortable you become. Before long, I was diving off my bow, donning snorkel gear and navigating my way around the bottom of the boat (while in the middle of Lake Michigan, mind you) just to feel her smooth lines and search for imperfections. I became friendly with all the little creatures that called my boat home (hungry birds and trillions of spiders mostly), and come summers end, I was the master of my own little water domain. 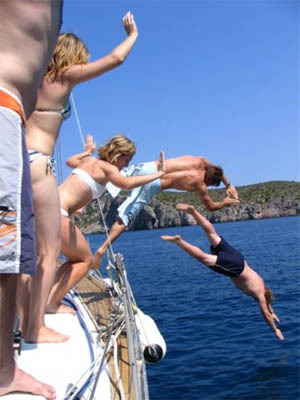 Share with anyone that you own a sailboat and the same thing will happen: wide-eyes, open mouth, insane jealousy. People think that you have to be loaded or a master captain, but not so. It’s all about gathering up a big pile of courage. It’s all about gathering up a big pile of courage. 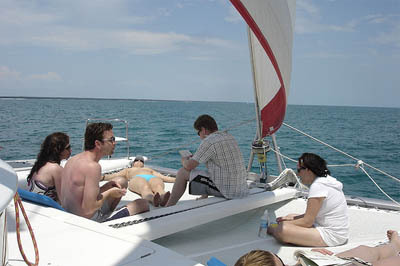 Boating turns to fun on the water once you learn how to read the wind and situate the sails based on that reading. A couple of classes with an instructor (on your own boat) are the key to becoming at ease with what you’ve just done (dropped 10k on a piece of fiberglass) and once you get the hang of sailing, it’s easy to get a party started. Everyone wants to learn to sail and I’ve had pals who are complete novices head out into choppy waters and once I gave them a short tutorial, they practically owned the helm. When you show confidence, they gain experience and in the end, everyone feels like a badass. I also tapped my eco-friendly vein and bought an electric motor for my dinghy. Me and pals would load up the Cuba Libres and silently troll around the marina spying on other folks’ set-ups. It’s almost a guarantee that anyone you take out sailing (or trolling) will end the day fueled up on stout drinks and proclaim, “I’m buying a boat!” See, sometimes you don’t have to even take the boat out of the slip to ignite the passion. Rare is the boat that is purchased and then just ready to go. And, even if you do happen upon one, it’s beyond easy to get drop into Westmarine for a small $2 bolt and walk out two hours later with $500 worth of goodies. The costs add up quickly when there are mechanics to pay, slip fee’s to rent, sailing lessons to take (private lessons $75/hr), gadgets to keep up with, oil changes to be maintained, gas tanks to fill up, provisions to keep stocked, solar panels to install, subscriptions to pay for and a litany of other things you want to do once you own a boat. But that’s the beauty of it all…you don’t have to do anything. In fact, to sail, all you need is a sturdy vessel and the wind. The rest is just heart-thumping joy. The stuff that makes you feel alive and in touch with the world. Note: If you want to get some hands on experience before spending a dime, check out the crew wanted section at Floatplan.com. You could wrangle your way into crewing in the South Pacific for some other fool who dropped his life savings on a boat—for FREE! Along with Misty, several members of the Matador community sail, some just for fun and some professionally. Ross has a cool blog about sailing in San Francisco Bay with Doug, who, like Misty just bought a boat without prior sailing knowledge and went for it! Cody, a professional sailor, helped them ramp up their learning curves. Finally, Darcey Maher is a professional sailor / boat captain, and author of the Traveler’s Notebook article How to Become a Boat Captain, which has some great additional resources for people interested in getting water time. Editor’s note: The author is currently “this close” to upgrading to a 32 ft. beauty (yachtworld.com) tucked into a small bay in Central America. Expect to find her there soon.